Summary: Create a GUI program that tracks the agency’s employees work history. Required Program Data: Obtain the required information from “Program 3 Data.txt.” You are allowed to hard code this data into strings so the file read is OPTIONAL! a. How the program is intended to work, meaning, the separation of the two functionality areas of the GUI. 2. Rename ‘Form1.vb’ to FirstName_LastName_P3.vb (for example, ‘John_Smith__P3.vb’). 9. Form UI closely matches the provided example in Course Files\Program Examples. 10. In the Work History area, single Listbox/textbox/listview is used. Listview is recommended. 11. In the work History area, the clear button clears text area, summary area and drop down. 12. In the Work History area, the supplied Program 3 Data information is formatted for easy reading. 13. In the Work History area, each time a combo box selection is made the History text is cleared and then displays only the currently selected info. 14. 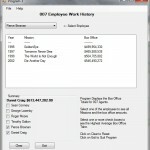 In the summary area, user can select employees with checkboxes and info displayed in a label. Only are checkboxes used. 15. 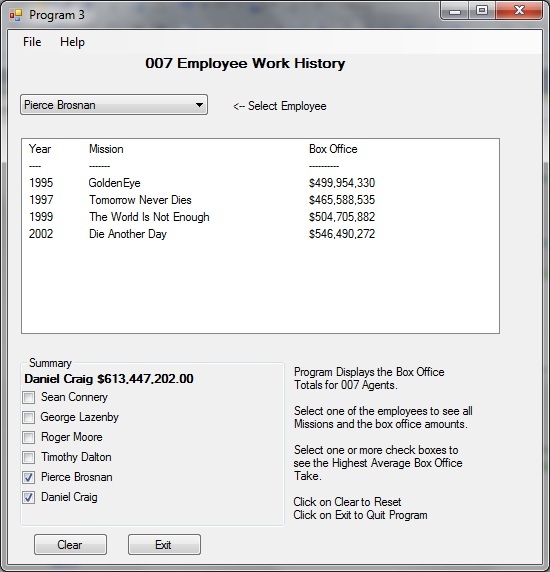 In the summary area, if 1 employee is selected the name and average info is properly displayed. The info label is updated in real time (doesn’t require the click of a button to ‘evaluate’). 16. In the summary area, when 1 employee is selected, deselecting the checkbox will clear the displayed info. 18. In the summary area, when >1 employee is selected, deselecting checkboxes will display correct info. The file read is 100% optional and is not recommended to even think about implemented until you have 100% completed the program. You will not obtain any extra credit for the file read; however, if implemented incorrectly – your grade will be impacted!